The June 2015 Strategy Session (Alberta Venture) features Chris McPhail of Strut Creative, trying to make me vomit. Um. Well. There’s more to the story. I promise. I’m wearing Oculus Rift goggles and acting like a five-year-old child on her first trip to Calaway Park or Galaxyland. I’m neither a gamer nor a digital native, so the virtual reality world I’m experiencing through the goggles is unfamiliar and kind of trippy. Before I begin, McPhail has to teach me how to use the controller (“You don’t play any video games?” “Not-a-one.”) And when I’m done—I’m facing in the opposite direction from where I started and where I thought I came back to… and I kind of want to vomit. Also, I’m really excited and want to do it again. I want to find out if I can lie down on the beds? Look inside the fridge? You know what would be really cool—if I could turn on the dishwasher. Can I do that? I’m jumping a little ahead of the programming, I’m told. Yes, all that’s possible—but it’s not coded into that module yet. Right. Prototype. Still. I just got to walk through a show home… while sitting in a chair in front of a computer. McPhail, whose team is the middle of developing and pitching the module I’ve just experienced to a Calgary home builder client, asks me to imagine the possibility of people having that experience at a booth in a mall, say. And once “inside”—imagine I have the option to change the colour of the paint, the type of flooring, the hardware on the kitchen… the appliances. Walk through four, a dozen different show homes. Choose to convert the bonus room into a bedroom. Maybe modify the lay-out of the kitchen? All while I’m in the middle of it, seeing the changes as I make them. What a powerful sales tool! The biggest obstacle to adoption? It’s new. It’s different. And everybody’s not doing it. Now, I love you all dearly and I don’t want to call you sheep. But. For a province and industry that prides itself on innovation, entrepreneursheep, risk-taking, all that sort of thing? Alberta business people have a pronounced fear of being the first. Don’t sputter in indignation. You want to be the best—ahead of the pack—and the first in doing that thing that’s just a little bit different. But if it’s really new and out of the box? Untested and untried? You’d rather the other guy tried it first. It’s actually not a bad strategy. First-mover advantage is, for the most part, a fallacy. The first-mover gets kicked in the bohunkus and into bankruptcy 60-600-maybe even 6000 times for every first-out-of-gate success. The first-mover often moves too early: when the technology is not quite good enough, the market not quite ready, and the business roll-out plan too ambitious. The second and third mover get to watch and learn from the bold one’s mistakes. At this point, McPhail and I are no longer talking about the Oculus Rift goggles and Virtual Reality. We’re talking about any new technology-tool-strategy-product. And how it’s all a question of timing. Investing money in a website or an on-line store before your customers were on-line had no first-mover advantage, really—but man, being there, established and ready to go as the consumer Internet took off, with technical glitches worked out and already-tested strategies… that’s still paying off for the almost-first movers. 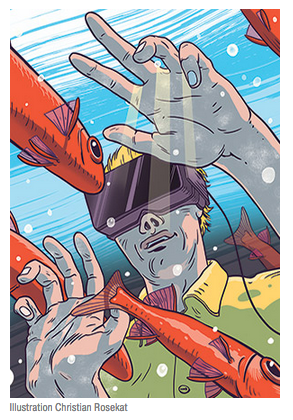 Now, I don’t really know if Virtual Reality marketing is going to be the next big thing—although Facebook’s Mark Zuckerberg clearly thinks so and research firm MarketsandMarkets predicts VR and augmented-reality hardware creators (like the Facebook-owned Oculus) will generate $1.06 billion in revenue by 2018. But I do know that the next big thing is coming, and we’re going to adopt it en masse and quickly: the Internet, Smartphones and social media have all primed us for that now. Odds are good the next big thing is going to hit us—oh, right about now. The ingredients are all there, economic slow-down included—creativity likes a touch of desperation and friction, and anxious people are vulnerable to distraction and shiny things. And because I desperately care about your success, I want you to see it coming… and to ride the crest of the first wave and gain competitive advantage. Be it VR or some other whacky idea your business development people are bringing to you—be open to it. Think about its potential. No one’s doing it—but could they? Would they? Should you pay attention to it, invest some time (and a reasonable amount of money) in exploring its possibility so that you’re just a little bit ahead of the pack when the timing is right? If no one else is doing it—is it possible they’re all missing the boat and your customers have a need for this type of product-communication-service-innovation right now? Being skeptical and cautious and doing your due diligence is smart. Being cynical and closed to possibility because you don’t understand it—because you don’t play video games—because you still resent the need for a LinkedIn profile—is stupid. And you’re not stupid, dearest. Right? Remember: first mover advantage is a beautifully documented fallacy… except when it’s not. Last mover advantage—no such thing. Marzena Czarnecka is a Calgary-based business and legal affairs writer. She can be reached at paddleink@gmail.com, stalked at @paddleink on Twitter, and visited at CalgaryBusinessWriter.com.